Roguish piracy has always been the unspoken code of conduct here at Sam’s and the twelfth century merchants’ house that comprises the original (mother) restaurant echoes the sentiments of those who were and are now found inside. While we as a company foster the individual personalities of our restaurants, Fowey’s atmosphere is the template that sets the benchmark for all to see and revel in. You are welcomed at the door and encouraged to enjoy the relaxed ambience and skillfully engineered service and before you know it, you’re back again for more the very next day! Adorned with the kitsch green and pink colour scheme that has since become so widely associated with Sam’s adventures across the county, the walls tell their own story of his musical appreciation and love of punk rock – The Punk Rock Pirates of Fowey, you might say! Now in our 28 year things have changed ever so slightly, we’ve refined our menus and moved with the times – regular house specials and individually crafted plates are the norm nowadays. And while the original Samburger still proudly features, there are now 12 different varieties to choose from, catering for all dietary restrictions and tastes. It’s safe to say here at Sam’s we know our fish. Caught on the dock and flashed in the pan is part of our make-up…the fresher the better in our book. Our classic bouillabaisse is a firm favourite with all our regular customers as-well-as the all the mussels and king scallops that live on our doorstep and make their way on to the plates of all three restaurants. The Cornish larder is most certainly alive and well and here at Sam’s we celebrate all that comes from this great county, giving all our satisfied customers a genuine taste of what’s grown, caught and reared within our borders. The opening of Sam’s Bar and Lounge, which is immediately above Sam’s, has meant that the need to wait for a table is less likely as there are an extra 20 covers. If you do need to wait for a table, or simply want to have an aperitif, the cocktail bar and lounge allows you to do so in comfort. The staff have been trained by a mixologist (cocktail mixer to me!) and serve a variety of cocktails for all the family including kids cocktails such as Teeny Colada. 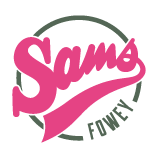 Sam’s Bar & Lounge is open to non-diners and has a late licence until 1am so if you’re in Fowey late one night and fancy a drink you know where to go! Again there is an exposed wall and it has the added bonus of a beautiful backlit window which was discovered during the renovation work. The building evokes thoughts of yesteryear and it is easy to imagine a group of men there having a drink and planning a little bit of mischief on the high seas! If you are interested in booking the Lounge for your special event, please contact Sam and Emma (fowey@samscornwall.co.uk) explaining briefly what you are planning and when.